Like the LX7 the LX100 has a multi aspect sensor. This means that the diagonal field of view does not change in the various aspect ratios. The camera is a micro 4:3 so the sensor size is half of a full frame sensor at 18×13.5 mm. However only part of this is used by the camera more specifically 13.7×10.3mm are actually used in the same aspect ratio. Now we have 4480 horizontal pixels and 2520 vertical so the horizontal field of view is wider than in the 4:3 or 3:2 aspect ratios. This means that at normal 1080p the camera will perform like a normal 3:2 sensor at 22.9mm. All of this to say that the LX100 like the LX7 are wider in movie mode than the Sony RX100 Mark III despite the lens is declared at 24mm in both cases as when we go to 16:9 the Sony crops the sensor and goes to 25mm whilst the Panasonic cameras stay at 24mm. So even at 4K 16:9 the LX100 will be marginally worse than the RX100 Mark III at 26mm vs 25mm. Note that the crop is 2.56x at 4:3, 2.47x at 3:2 and 2.38x at 16:9. 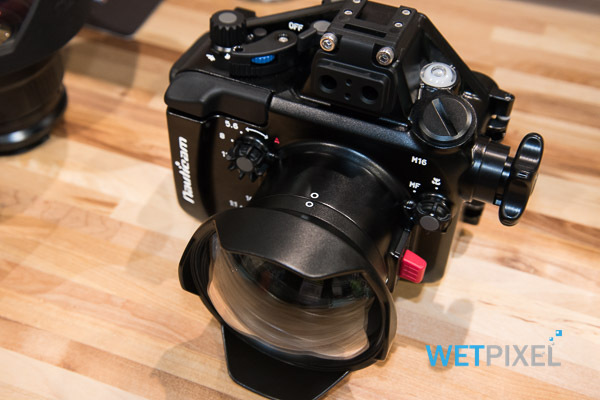 We don’t have details about wet lenses yet but for the solution with a dome like the Ikelite housing or the Nauticam mini dome we are talking about a maximum field of view of 79.52º at 4K which is acceptable for most cases. The challenge like with the Sony RX100 Mark III is at telephoto end were 81mm in 4K is quite little. Panasonic has however the option of the iZoom that was pretty useful with the LX7 and that crops down to a ‘normal’ 1920×1080 which promises to be pretty good with a 2x digital zoom with scaling. In DxoMark sensor test the LX100 scored the same of the RX100 Mark II and III with a minimal improvement in low ISO. Which in shorts leaves to the conclusion that unless you need 4K the Panasonic LX100 is not going to be your wonderful underwater camera however if you can process the 100 mbps IPB files that the camera produces, the result when scaled down to 1080p has got so much more quality compared to other 1080p cameras. The lack of the ND filter compared to the previous LX7 is a miss, but Panasonic though that at f/16 there are anyway the 3 stops so performance will not suffer, we disagree with that as surely diffraction will be substantial at f/16 and we rather have less depth of field near the surface than more. Let’s face it, the LX100 is half the cost of the GH4 if you use the nauticam housing and this is before the GH4 has added lenses and ports, the GH4 will give you richer color and probably 2/3 step ISO improvement and much more if you use an external recorder but the LX100 is the 4K camera for the consumer and we are looking forward to a full operational housing from Nauticam, Recsea or any other! The American manufacturer is the first to reach the market with a polycarbonate housing for the Panasonic LX100. The first thing that we notice is that not all controls are accessible, is this going to be an issue? As the LX100 with a 24mm lens is not going to be really a photographer dream Ikelite could have spared an expensive TTL converter but I requested confirmation from the manufacturer and they said only a TTL version is planned – not good for us! The housing looks a bit bulky as usual but considering that for video we access a limited set of controls this is not going to be a major problem except maybe the rear metal buttons. Probably the best feature of this housing are the accessories. The housing comes with a large 3.9″ flat round port that per-se is not good for much, however you can add the WD-4 Dome and the macro M67 adapter to improve matters. 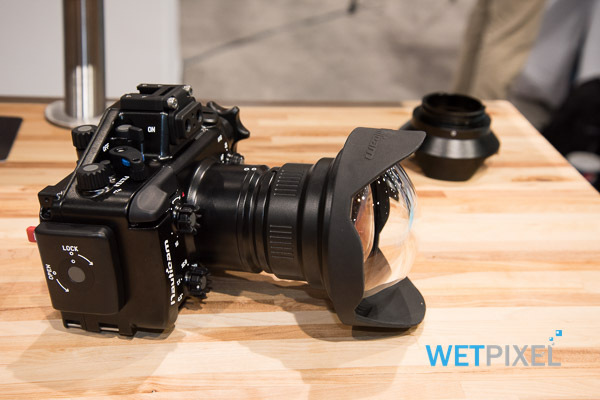 The WD-4 dome is a glass removable dome that is sharp and will restore the lens field of view and allow for some zooming, the macro adapter allows to mount M67 close up lenses as a push on. Probably the feature that will miss the most is the focus mode switch as the rest can work quite nicely with focus lock. Cost wide the housing is $750 with the WD-4 and the Macro adapter this totals at $1115 plus taxes. 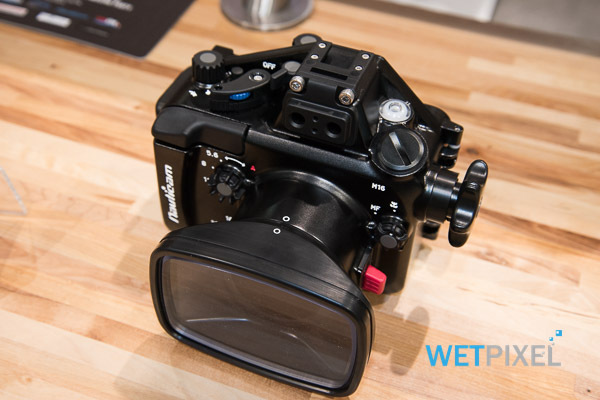 The nauticam housing is rumored to be $1,100 without ports so this ikelite housing could be competitive and we like the port system a lot for simplicity even if the choices are a bit limited as all in all this is good enough for video if combined with a selection of diopters. The lack of the focus mode switch could create some challenges in portrait work with the bare port but a series of mid range close up lenses can fix the issue.